The mutant lacks expression of two proteins CCp1 (LAP2, LCCL/lectin adhesive-like protein 2; LCCL domain containing protein CCp1) and CCp3 (PbSR, P. berghei Scavenger Receptor-like protein; PSLAP; LAP1). The ccp1 and ccp3 genes are members of a small conserved gene family, encoding proteins with multiple adhesive domains, for example a Lgl1 (LCCL)-lectin adhesive domain. 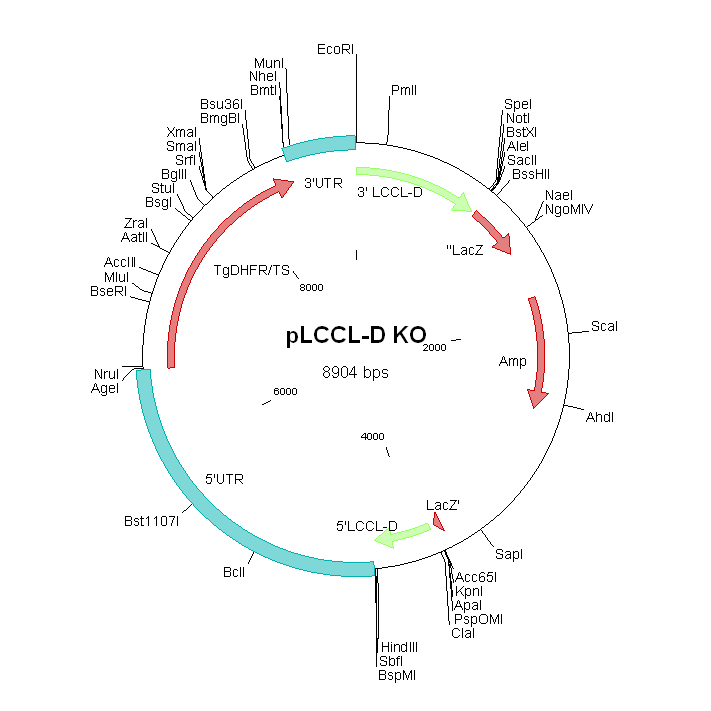 In P. falciparum the LCCL domain-containing proteins are termed PfCCp's and in P. berghei PbLAP's. In another study (Raine, J.D. et al., 2007, PloS Pathogens 3, e30) it has been shown that crossings of ∆lap2 (ccp1) and ∆lap1 (pbsr/ccp3) mutant females with wild type males did not rescue the formation of sporozoites. In contrast, crossing of the mutant males with wild type females resulted in wild type production of sporozoites that were infectious to C57BL/6 mice. The lack of rescue of the mutant phenotypes by crossing of mutant females with wild type males is suggestive of a role of these proteins within a few hours after fertilisation. Additional remarks genetic modification The ccp1/lap2 gene has been disrupted using a construct that contains the tgdhfr selectable marker and that integrates by double cross-over recombination. This mutant line (429cl1) has been described as mutant RMgm-121. The ccp3 (pbsr, lap1) gene has been disrupted in this line. The ccp3 gene has been disrupted using a construct that integrates by single cross-over integration (insertion vector) that contains the hdhfr selectable marker. The disadvantage of using an insertion construct is that the construct can be removed from the genome, thereby restoring the wild type genotype. 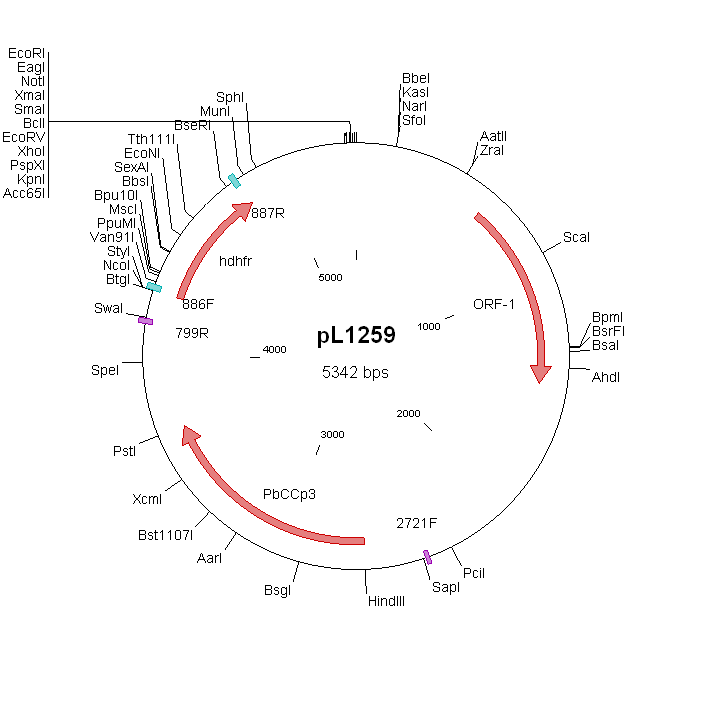 Additional remarks genetic modification The construct to disrupt the ccp3 (pbsr, lap1) gene has been introduced into the genome of mutant 429cl1 (RMgm-121) that contains a disrupted ccp1/lap2 gene and the tgdhfr selectable marker. Additional remarks selection procedure Because the mutant contained the tgdhfr selectable marker in its genome (used to disrupt the ccp1/lap2 locus) the ccp3 gene has been disrupted using a construct that contains the hdhfr selectable marker that provides resistance against WR99210.